In this shot of caffeinated wisdom, Alun Evans explores what might just be the strangest phenomenon in global coffee consumption. Not a week goes by when I do not get an email from someone, somewhere in the world, asking me a question relating to kopi luwak. 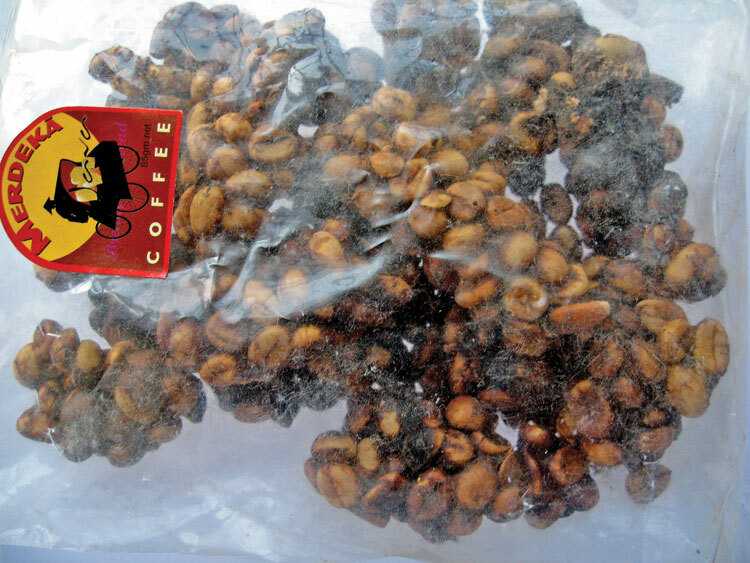 Kopi luwak, or “KL” as we call it, is one of the rarest and most expensive coffees in the world. At around $800/kg it dwarves the moderately expensive Jamaican Blue Mountain and Hawaiian Kona Arabica Coffees. For those of you who do not know what kopi luwak is, take a deep breath, put your cappuccino down and read on. Luwak is the Indonesian name for the Masked Palm Civet. This animal has close relatives throughout most of Asia, as well as in Ethiopia and Kenya. Its poor cousin in China got blamed for being a link in the SARS epidemic in 2004 and got pretty much wiped out in a government cull. Before that it had been a culinary delicacy in Mainland Chinese cuisine. In Indonesia, the range of the luwak is quite widespread. Their habitat includes higher altitude, less densely populated areas of Sumatra, Java, Bali, Sulawesi and the islands of Nusa Tenggara. The luwak is nocturnal by nature and is quite wary of human contact. It nearly always comes out at dusk to hunt for food and to forage, by morning it is tucked up sleeping. The luwak is an omnivore, eating mainly fruits, but not averse to raiding a hen house for eggs, or scavenging for mice, rats and small chickens. Often it is demonised in small villages for its ability to damage poultry production, perhaps in a similar vein that weasels are not on any farmer’s Christmas Card list in western countries. So this brings us around to the part the luwak plays in one of the stranger chapters of global coffee consumption. Not unlike the way in which coffee was first discovered (thanks to a herd of dancing goats back in Abyssinia over 1000 years ago), kopi luwak somehow accidentally made its way from animal to human; albeit in a more direct and slightly revolting way. 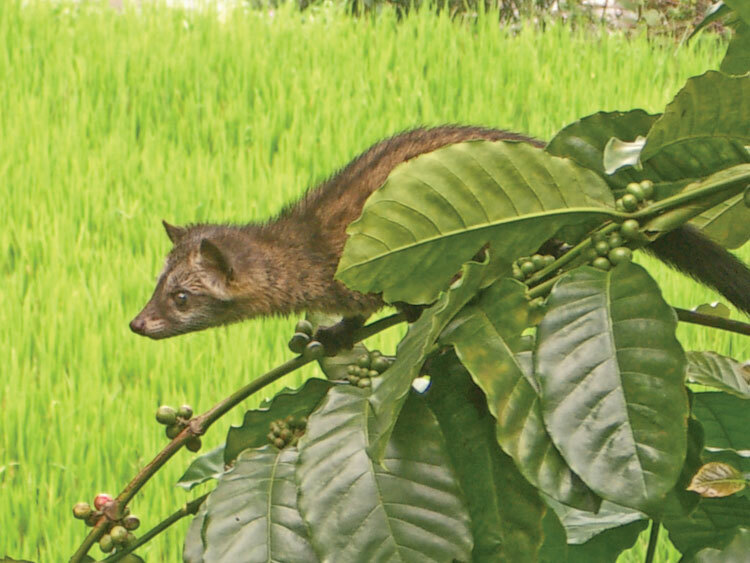 Luwak generally forage ripe coffee cherries from the trees during the night, gorging themselves on the fruit. The gastrointestinal tract of the animal removes the pulp and skin from the cherry, but is unable to digest the stone or bean inside. Finally the beans are deposited in a starfish-shaped pile from the rear end of the luwak. The excrement, which looks a bit like peanut brittle candy, is then collected, cleaned, dried and roasted by the villagers, who savour it for its unique taste profile. Of course, in the village kopi luwak actually has two meanings. The first and most common does not actually refer to coffee consumed and subsequently passed by the luwak, but rather to ripe coffee that was picked by human hand, the luwak reference being to the fact that if the luwak had seen the cherry first he would have eaten it, as it was that ripe. As the luwak is an omnivore it must be said that the taste of the final cup does depend somewhat on what else it has been eating along with the coffee cherries. Cupping reports from experts include comparisons to fruit such as papaya, pineapple, mango and blackberry. On the other hand there are also frequent comparisons to “game” (meaning the dead mouse consumed before the coffee cherry, I suspect). As the luwak is an omnivore it must be said that the taste of the final cup does depend somewhat on what else it has been eating along with the coffee cherries. As the luwak is found all over the coffee producing regions of Indonesia, the regional cupping characters of the coffee will still be apparent in the coffee. Because over 80% of coffee from Indonesia is the less interesting robusta, the luwak’s intervention in the traditional coffee chain does not dramatically change the cupping character of this type of coffee. The cupping characters of the arabicas, however, are altered by the inner workings of the luwak. I had the pleasure to accompany Professor Massimo Marcone, from the University of Guelph, on a TV documentary shoot back in 2004. Professor Marcone is the world’s premier civetologist. His study of civets has taken him from the Horn of Africa, through the Philippines and Malaysia to Indonesia. His passion for civets is contagious. During the filming he described to me in great detail just how the luwak’s intestinal system affects the coffee. Apparently the combination of scenting glands on the rear end of the animal, along with the secretions in its digestive system, contributes to a unique finished product. He has also devised a method to detect whether kopi luwak is the real deal, or fake. He estimates that around 48% of all kopi luwak on the market is fake, or at the very best very small quantities of real stuff mixed in with normal coffee filler. When paying such a premium, it is wise to make sure the coffee you are buying is certified as being authentic. 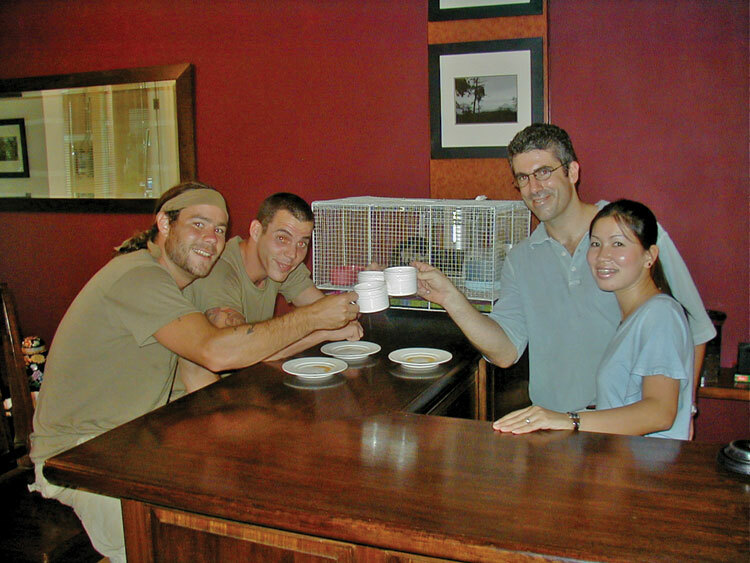 One of the more interesting groups of luwak hunters to turn up at Merdeka Coffee’s door was the cast of MTV’s Wildboyz (including Steve-O, Chris Pontiak and Johnny Knoxville from “Jackass” fame). 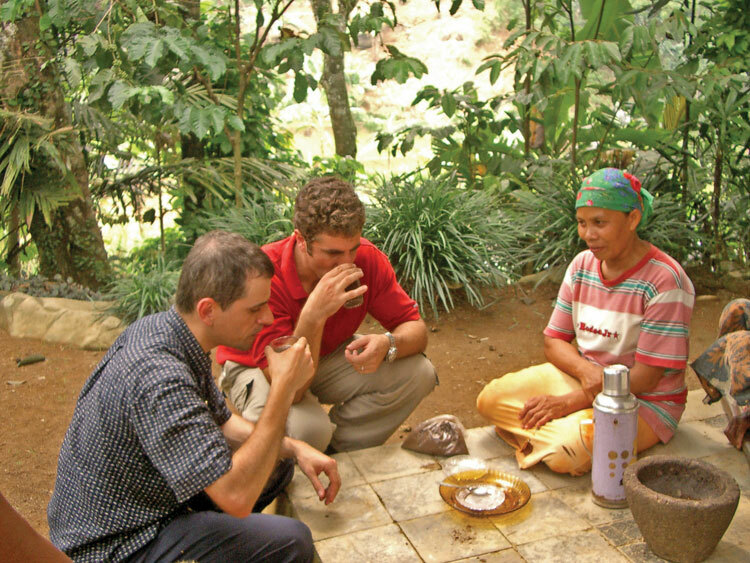 Kopi luwak indeed attracts its fair share of both true sceptics and coffee crazed fans. American TV talk shows such as Oprah have regularly featured it. One of the more interesting groups of luwak hunters to turn up at Merdeka Coffee’s door was the cast of MTV’s Wildboyz (including Steve-O, Chris Pontiak and Johnny Knoxville from “Jackass” fame). Steve-O had a great tussle with the luwak, which left him (Steve-O) scarred and battered. In the final shot of filming he scooped up some raw luwak pooh containing coffee, consumed it and claimed with great satisfaction: “Good to the last dropping!”. Whether it deserves a serious place in the mainstream of specialty coffee is debatable. However it can not be doubted that kopi luwak is absolutely unique and it comes from right here in Indonesia. Alun Evans is a coffee roaster based in West Java, Indonesia. His company Merdeka Coffee, is pioneering relationship coffee with farming communities throughout the country. Visit www.merdekacoffee.com for more details.